All French train tickets can be ordered online - and even printed out on your own computer as an e-ticket, or stored on your phone as a QR code, like plane tickets. But not from all sources. And not all online ticket sellers sell worldwide, and some charge more than others. About-France.com recommends Trainline.com Best rates, no extra fee, no surcharge, seating choice. Available worldwide for print-your-own tickets or e-tickets or QR code. Eurostar provides city-centre to city-centre high speed train services between London and Paris (and Brussels). But there are also some other direct services, and plenty of other destinations can be reached with an easy change to French TGV services at Lille Europe station. The most convenient means of travelling by train from London to provincial cities in France is to take the Eurostar (click for the Eurostar website with prices and booking) from St. Pancras, Ebbsfleet or Ashford to Lille Europe, and connect at Lille to a French TGV. 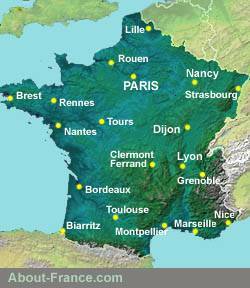 There are direct TGV connections from Lille to the main towns and cities in most regions of France, including Bordeaux, Rennes, Nantes, Dijon, Besançon, Lyon, Avignon, Aix en Provence, Marseilles, Montpellier, Perpignan or Nice. By changing at Lille, travellers do not need to change stations and haul their luggage across Paris. At Lille Europe station, Eurostar trains from London and Brussels use the same platforms as French TGVs going all over France. See Rail travel in France. Provence. Eurostar also offer direct Disneyland special services to Paris-Marne la Vallée station. Apart from the direct services, the Paris Disneyland can be reached by changing onto a French TGV train at Lille Europe. By changing at Lille Europe station you can reach a large number of destinations across France with just a single connection. France's SNCF has recently improved the connections schedule; and in France, when two trains are meant to connect, in the event of a delay the second train is held up until the first one has arrived - unless the connecting train is terribly overdue.